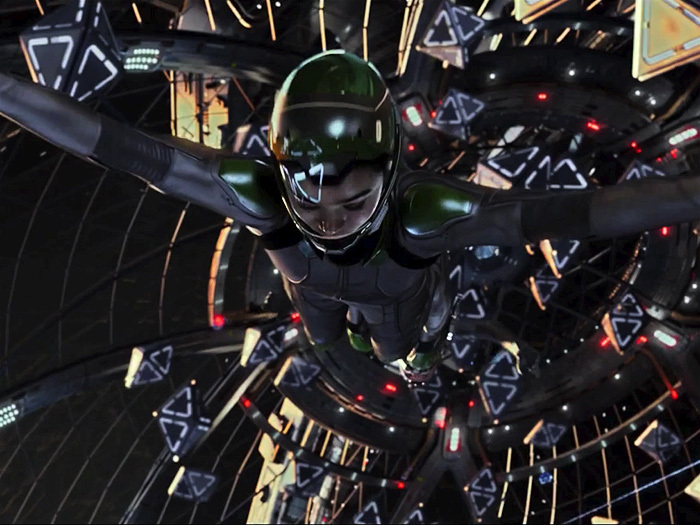 An underwhelming adaptation of Orson Scott Card’s cult science fiction novel, Ender’s Game is a shiny spectacle with a hollow center, a missed opportunity that makes a half-hearted statement. Ender Wiggin (Asa Butterfield, Hugo) is an introverted child gifted with a strategic mind that makes him an ideal candidate for training in the International Fleet, tasked with protecting the Earth from an alien race who attacked the planet 50 years earlier. The invasion resulted in millions of casualties and was barely thwarted; as such, the planet is desperate to defeat the aliens decisively before they can make another attempt. Due to their mental malleability and video game-enhanced reflexes, children are seen as better candidates as fleet strategists. Ender’s older siblings washed out of the program — his brother Peter (Jimmy Pinchak) was too violent and sister Valentine (Abigail Breslin) was too compassionate — but he is viewed as a prodigy to be groomed by Colonel Graff (Harrison Ford in one of his best performances in years) and Major Anderson (Viola Davis). His training largely involves playing zero-G laser tag with squads of other adolescent Napoleons in an orbital space station in between learning to be a leader, dealing with the pressure placed upon him, and sparring with bullying team leader Bonzo (Moises Arias), whose escalating antagonism brings out Ender’s dark side. Gavin Hood has improved as a director since the best-left-forgotten X-Men Origins: Wolverine, but he’s never able to deliver on the lofty intentions of Card’s novel or adequately explore its themes. Granted he has a lot of ground to cover with a story that examines war from a variety of complex and unsavory angles, but he cuts corners in all the wrong places. Like many filmmakers working with science fiction, Hood gets caught up in effects and action sequences and loses sight of his characters. Ender’s Game is true to its source material, but slavishly so. hole chunks are lifted from the book but aren’t reshaped to fit the different medium, and so a certain clunkiness sets in. Too much time is devoted to tedious training sequences that aren’t put into context as well as redundant Greek-chorus exchanges between Ford and Davis, and later Ford and Ben Kingsley, who plays a half-Maori war hero who comes across as a Yoda/Mr. Miyagi hybrid with an admittedly cool facial tattoo and an affected Kiwi accent. Card’s novel had a keen edge to it that cut to the quick as it explored the notion of shaping adolescents into cold and calculating battlefield commanders by approaching warfare as a game to be won at any cost, up to and including genocide. Hood dances around the premise, takes a few stabs at it, but never really engages with it or its implications. He plays it too safe, going so far as to soften to Ender’s fateful confrontation with Bonzo and attempt an upbeat ending that hints at a sequel. Both rob the movie of the gut-punch that made the novel so effective.